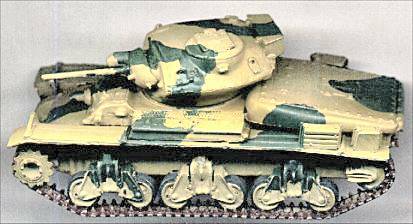 The Australian Cruiser Tank, Sentinel AC1 is a classic of its kind and represented a great achievement for the Australians in WW2. The Australians had no experience in tank development and yet when faced with the prospect of difficulties in obtaining vehicles from overseas were able to develop a vehicle that proved capable of significant upgunning to take the British 17 pdr. Matador have, over the past couple of years, started to issue 1/76 models of the Sentinel series of vehicles. The AC1 and AC4 are already issued (Aug 2002) and the AC3 is under development. 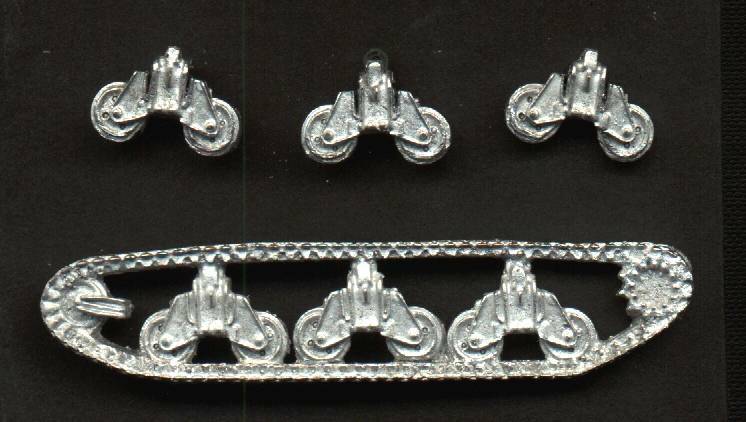 The AC1 is a kit of white metal castings, with the track and suspension cast in one piece per side. Herein lies a problem, as, unfortunately, I was less than impressed with the quality of these castings. I therefore decided to rebuild the suspension. Here you can see RH track and suspension in its original form, also the individual suspension units "liberated" from the casting. I cleaned these up, cut vertically between the suspension arms and central bracket and also removed material from under the top of the central bracket beneath the return roller mounting. Finally, I added my own return rollers from the scrap box. I then constructed new sprocket assemblies from Airfix Sherman sprockets and cut slots in the rear idler brackets to take new idlers from the scrap box. The track is also from the Airfix Sherman. This was very old track from my scrap box, and being aware of the dangers of "track rot" resulting from migration of the plasticiser in these into the polystyrene sprockets and idlers, I was very careful to thoroughly protect these. I first coated the polystyrene with a superglue film, and then performed a careful paint-job on both the polystyrene parts and the track. With the track, I painted the metallic parts with rust paint and the rubber pads dark grey. Whilst the paint was still tacky, I placed the tracks in a small polythene bag with some ash powder and shook thoroughly. I then removed them and dusted them off. This produces a very satisfying finish. Here you can see the trackwork during fitting trials prior to painting. Assembly of the rest of the model was straightforward after first cleaning up the parts and removing any mould marks. The final vehicle makes an interesting model and despite the suspension difficulties I am pleased with the final result and I shall definitely be building the AC3 and AC4. For an excellent photostudy of the AC1 at Bovington see Chris Shillito's Armour in Focus site. This includes some good shots of the suspension units.